It's Friday!! That means only 4 more school days (not counting today) until it's officially SUMMER in our house. Andrea, Narci, and I are sharing our Friday Faves! You should join us! First up...have I already shared these pictures?? I might have, but they make me laugh. I'm totally sharing again. A couple weekends ago we met Sheaffer and Carter for a little mall playdate. Ebby Lee got this fabulous pair of glasses in her kid's meal. They were her FAVORITE! She wore them all weekend long and she even told me they helped her read better! ha! I don't know about you but with three kiddos close in age there is a lot of messing with each other. They don't always use the kindest words or gentlest hands with each other, but those moments when everyone is getting along are my FAVORITE! Do I wash my hair at night or in the morning? I wash my hair in the morning for sure! If I go to bed with wet hair, I wake up looking like a crazy lady! Nothing good comes from that. Trust me. I wash my hair every two-three days. I'll use dry shampoo on the days I don't wash my hair. I use the Hot Tools 1 inch curling iron. What kind of straightener do you use? I forgot a picture, but I have the BaByliss Flat Iron. A couple years ago my Target brand one completely stopped doing the trick. I upgraded to this flat iron and it's been GREAT! What blow dryer do you use? I use the BaByliss Nano Titanium blow dryer. Lunch dates with these two are my FAVORITE! 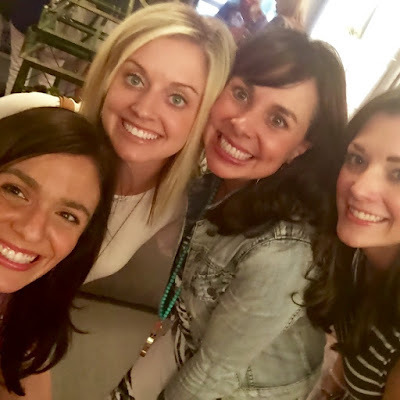 Last night Narci, Andrea, Marla, and I drove to Dallas to support our girl, Sheaffer, AND do a little shopping while we were down there. Because why not, right? It kind of looks like I'm about to doze off in the above picture, but I'll take it. haha! We had an absolute blast! Accessory Concierge has the cutest stuff. We all came home with some darling goodies! Fun night with some FAVORITE girls! Have a GREAT weekend, Girls!! You girls are so cute!!! I love your shorts at the party too. So cute and summery! Ebby Lee wearing the glasses is like my favorite thing EVER! She looks adorable :). And then I loved the pics of Nix and Ebby Lee dancing...that melted my heart. Oh my gosh!! 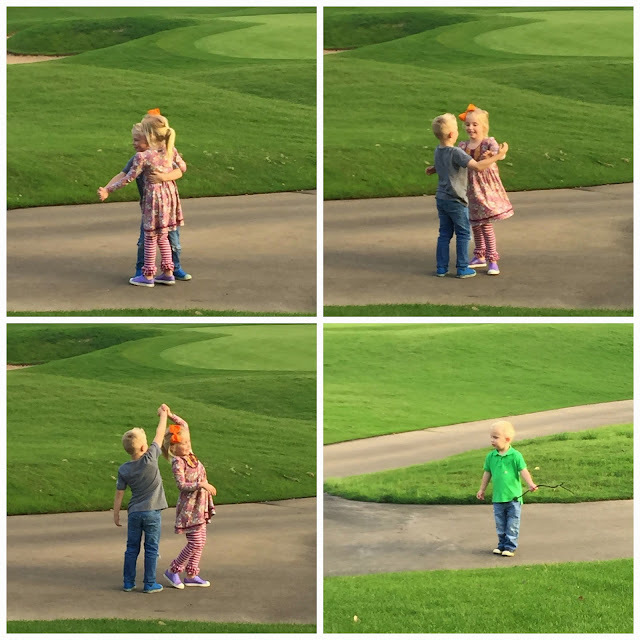 Nixon and Ebby Lee dancing together is adorable! Love!! She did rock those Superman glasses. Haha! You are so welcome! It was such a fun night! Yay!!! Hair soul sisters! Can you wash yours at night? I love Ebby Lee in those glasses! So cute and funny!!! Y'all have a great weekend! My son is always a messy guy after eating....... anything, it's a boy thing. I swear either he's getting neater or I'm just beginning not to care. The pics of your kids dancing are amazing!!! Thanks, Elaine! You too, girl! Love the pictures of the kids dancing, too cute! I'm like you, if I wash my hair at night I wake up looking like a hot mess and there aren't enough products in the world to make it look right! I definitely am a wash my hair in the morning girl! 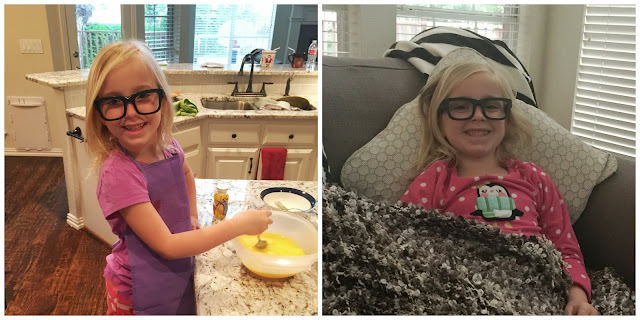 Love the pictures of your precious kids. Found you through my new friend over at While I'm Waiting. 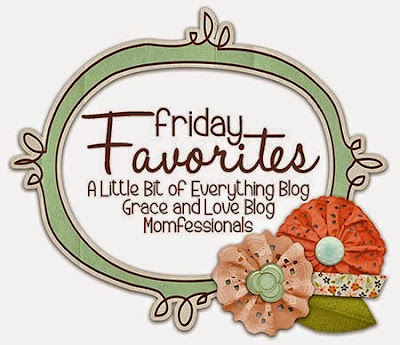 Glad to find your site and this Friday Link Up. Erika I love your shorts and shirt in the shopping/ girls night pic. Do u mind sharing where they are from? It's actually a romper. I got it at a local store in Downton McKinney. If you're local, let me know and I'll give you the exact store. :). Thank you! Erica, what kind of sandals do you have on in the girls night picture? I would love to know where your shoes are from? Perfect height! Love the glasses!! And yay for GNO and shopping!! I just might have to get that tassel necklace!! Hope your weekend is fabulous!! Oh my word. Those glasses on Ebby are ADORABLE. And the pictures of them dancing - oh my heart. That is the sweetest thing I've ever seen.